Transcript: What about Fathers and Storytelling Techniques? Voiceover: The mid-morning magazine with Mike continues with page two on 1240 KBIZ. Mike: Welcome back to mid-morning magazine on this Thursday morning. Well, according to a 2009 national PTA poll, get this my friends, nearly half of all dads fall short of their parental responsibilities. Dads claiming jobs and outside the home responsibilities are seriously limiting their family time. The results can be very serious indeed. Now national storyteller K. Sean Buvala says that one simple solution is to engage your children through bedtime storytelling. Storytelling in all its forms is important for building reading and math skills according to Buvala. He says it’s also an easy way to spend quality time with your children. Now Sean, a father of four has been a full-time national storyteller and business coach for over two decades, nationally traveled workshops and keynote presenter for 23 years, 17 years experience as a youth and family coordinator for a variety of non-profit organizations, founder and director of Storyteller.net, a leading online resource for both tellers and listeners of stories, and has received numerous rewards from the National Storytelling Network. He joins us this morning. With that, I say a very pleasant "good morning," Sean. Sean: Good morning, Mike, what a great privilege it is to be on programs like yours, thanks for having me. Mike: It’s nice to have you on. Sean, why is something so simple as telling a bedtime story so important to our kids today? Sean: You know, Mike one of the things that happens in this world is we as parents, and as grandparents, and aunts, and uncles, we get so busy trying to survive that we miss out on the most basic things that affect our children. One of those things is looking our children in the eye, bonding with them, and passing on our values, That’s the power of telling stories to our children: to pass on our values, to bond with them, to be a hero in their eyes. We talk about fixes to education; but if more parents, more dads, would sit down and spend 20 minutes a day telling stories, not just reading, but telling stories to their kids they’d see a huge improvement in everything about (their child's) education. Mike: You know, I can remember when my two boys were real little, that’s one of the things we did during the evening time was both my wife and I, we would read stories to the kids and we would read until the point they finally fell asleep. I don’t know if it was because we were boring readers or what, but today, boy, I tell you Sean, it’s a completely different story today. Everybody is too busy doing too many things. Sean: You know, that’s true. Some of those same studies talk about the fact that we as dads maybe spend, maybe on average, spend thirty minutes a day – and the purpose of my book and my work is not about "let’s bang on dads and say how bad they are." It’s not that at all. It’s to say there’s a way for you to change what you’re doing in 20 minutes a day; not just reading books but even putting those books down and engaging your children completely in the telling of stories. Yeah, it is part of helping them go to sleep at night, you’re completely correct about that. But, it’s more than that. It’s giving them reading skills, math skills, relationship skills as well. Mike: Sean, I have to tell you, the cover on your book Daddy Teller; I’ve seen a lot of book covers but I think this one’s probably the neatest and the cutest one I’ve ever seen. It’s a picture of a dad, obviously, and his son, little son and they’re just kind of got their foreheads together and to me that’s a pretty touching picture there and a nice cover for your book. Sean: Thank you very much, I really appreciate that. We worked really hard and went through tons and tons of pictures and said, "which one of these really captured what we were talking about?" It would have been easy to have a bedtime picture on there, but (the book) goes beyond that. Storytelling is not just for bedtime. That photograph is from an Australian photographer and I think she did a great job on it. Mike: You make a point, Sean, about the difference between reading books and telling stories. Expand on that just a little bit. Sean: Oh sure. You know there are two different skills that we’re talking about here. There is, of course, a lot of value and importance in reading books to our children and in sharing stories that way. That brings in a very particular set of skills for children to learn; reading skills, following along, all of that. 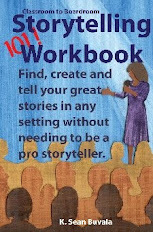 As well as doing that, I help people learn to tell stories. Put that book down, and create stories that can be used to teach children certain values. Sometimes as dads, because of our business in our life, we just kind of pick up the first thing that’s there. What we did in the Daddy Teller book was create eight stories, there’s actually nine when people join the group, but we give them eight stories that tell them exactly what to do, what to say, where to put your hands, all of that. You’ve seen the book, Mike, so you know, it’s all laid out there. There’s a lot of detail in there. I also encourage our children to tell stories back to us. Telling stories back and all of that, those are pre-reading and even, believe it or not, pre-math skills. And so not only when I tell my kids a story am I just having story time, but I’m really helping their future as well. Mike: In your book, DaddyTeller, you focus very much on helping dads learn storytelling skills. Is there any particular reason why your chose the fathers over maybe the mothers? Sean: It’s really interesting. I think, as it should be in our world, there is a great deal of support for mothers and mothering. I think sometimes, though we say to dads, "Well how come you’re not doing better?" But, we don’t provide dads the resources for that. The other side of that is very practical. I spend most of my work as a storyteller working in corporate situations, you know people fly me into Iowa and I do these corporate workshops and corporate communication. When I get done with one of those workshops, the men will come up to me, women as well but we’re talking about men, men will come up to me and they don’t talk to me about what I was hired to do this workshop. What they say to me is, "boy I bet your kids are really lucky to have a storytelling dad." And I say "Well, yeah they’ve learned to say 'only tell me the funny parts.'" Then, the men at the conference, they say to me "I wish I could tell stories like that." You know, Mike, they’re not saying to me I wish I could be a storyteller, what these dads are saying, when you get into conversations is, I wish I could communicate with my kids. Isn’t that what all of us want as dads: To really be in real communication with our kids? Mike: Oh you bet. Now Sean, I’ve got to get myself on even keel here because I know the ladies are probably – if I don’t mention the mothers after the show they’re going to be calling saying, "Hey Mike,you didn’t say a thing about moms here." So, can your book also be used by moms too? Sean: Absolutely, it’s written very much from a guy perspective. You have a copy in your hands there, so you know that it’s designed as a very unintimidating book. I mean I really designed it for the men in my life; my brothers. (There are) men in my life that hate to read, and so the book is very much written from a guy perspective. I had a woman, another professional storyteller with four sons, say "They’re actually going to be able to read this book." Do mothers use the book? Absolutely and anytime I do a workshop, of course, we’re not eliminating any genders and telling them they can’t be part of this process. The book certainly can be used by anyone who has any connection with children. Mike: How does a dad get started in telling stories to his child, Sean? Sean: The first decision is to decide to do it. By far, the thing that I hear the most from men when we talk about the book in the workshop, they say "what if I do it wrong?" To be really honest about it, you can’t do it wrong. When you are looking your children in the eye and talking to them and giving them the attention they deserve for that ten minutes, or that twenty minutes, you will not fail. So that’s the first thing. The other one is to simply dive in and get started. If people go to the (daddyteller.com) website, there’s a free story they can download- they could be telling stories tonight. But just get started. We do a number of little free training videos on the site. So what do I do first? The answer is open your mouth and start telling stories. Don’t, don’t be afraid and don’t worry about failure. It’s not going to happen, not going to happen. Mike: Well, Sean, I think if more people read your book like I have and also see it, I think our world would change a heck of a lot; there’s no doubt about it. Quickly, how can listeners get a copy of your book? Sean: The main site is daddyteller.com, and of course the easiest, fastest way as we do in the world now is Amazon.com. So go to Amazon.com and search for Daddy Teller. There’s a couple of different ways to purchase the book. You can also get it as an e-book, as a download from the Daddy Teller site as well. I just hope that people go to the Daddy Teller site because there’s so much free stuff there and resources as well. So, Daddy Teller or Amazon.com. Mike: Sean, thanks for joining us this morning and thanks for a job well done. Sean: Thank you and I again really appreciate being on your show. Thanks for your time, Mike.